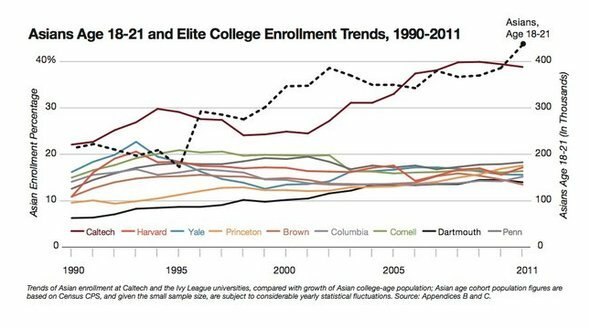 The chart below – which compares Asian-American population growth, Asian-American admissions at race-blind CalTech, and admissions at the elite Ivy League schools, provides strong statistical evidence that something squirrely is happening. Borrowing the Supreme Court’s “two or three standard deviations” standard, I think it’s irrefutable that there is some sort of discrimination happening. After the Justice Department closed an investigation in the early 1990s into charges that Harvard University discriminated against Asian-American applicants, Harvard’s reported enrollment of Asian-Americans began gradually declining, falling from 20.6 percent in 1993 to about 16.5 percent over most of the last decade. 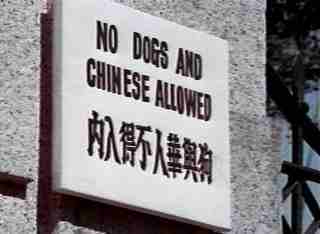 Postscript: It would appear that the “No Dogs Or Chinese” sign alleged to have been at Public Park in Shanghai, China is apparently a myth – the sign actually put it much more politely as “The Gardens are reserved for the Foreign Community.” The image above is actually from the Bruce Lee movie Fist of Fury, which depicted the sign at the entrance to the park.